On grades, the load should be tilted back. The forks should not be raised or loaded while the forklift is moving. The forklift should not be operated at a speed that would not allow the operator to stop safely. The operator should slow down and sound the horn wherever vision is obstructed, such as in cross aisles. Only trained, authorized personnel should operate a forklift. A forklift should not be driven toward a person who is standing in front of a fixed object. Workers under age 18 should not be allowed to operate forklifts. If you were injured at a construction site or elsewhere in a forklift accident, you should talk to a knowledgeable personal injury attorney as soon as possible. A prompt investigation is key to preparing a compelling case for compensation for the injured person. Depending on the circumstances, the liable party in your forklift injury case may be the operator, the owner, the property owner, an employer, a manufacturer or other individuals or entities. As with any personal injury case, details vary greatly from one forklift accident to the next. A detailed investigation is crucial. Talk to a lawyer at your earliest opportunity to learn how to go about pursuing compensation for your injuries. Case Example: In a recent case, our law firm obtained a judgment in excess of $400,000 for a construction worker who sustained multiple fractures to his knee when a forklift operator disengaged the clutch of the fork lift and dropped a heavy steel plate while doing demolition of at a nuclear reactor site in Eastern Washington. The trial judge concluded that the forklift operator was negligent and his company was liable for our client's injuries and damages. At Kraft Davies, PLLC, our Seattle accident attorneys carefully review potential cases, beginning with a free initial consultation. In addition to forklift accidents, we aggressively handle pallet jack accidents and scissor lift injuries. Powered pallet jacks, also known as electric pallet trucks, walkies, single or double pallet jacks, are motorized to allow lifting and moving of heavier and stacked pallets. These generally contain a platform for the user to stand while hauling pallets around a warehouse or loading/unloading trucks. Because pallet jacks are used to move heavy loads, they can lead to serious injuries when they are not operated properly or are defective. If you sustain a serious injury because of the operation of a pallet jack, contact our firm for a free evaluation of your case. Painters and construction workers regularly use scissor lifts and other mobile lift platforms to work on ceilings and other high places. Because scissor lift injures are common, OSHA regulates the use of scissor lifts and provides standards that general contractors and companies must follow to protect workers from serious injuries. 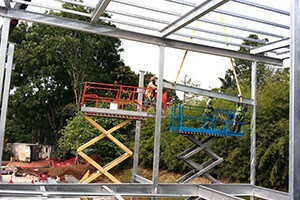 In other contexts, scissor lifts or mobile lift platforms can be defective and an injured worker may have a product liability claim against the maker of the scissor lift or mobile lift platform. If you have been injured by a scissor lift, contact our firm for a free evaluation of your case by an experienced personal injury lawyer. To limit our caseload to an effective number of cases handled at any given time, we carefully choose those clients whom we believe we will be able to help the most. We hope you will also select your lawyer carefully. For more information or to schedule an appointment with an experienced attorney regarding a case that involves construction site injuries, scissor lift injuries, pallet jack injuries, injuries working at sea or on the water, maritime law, admiralty law or other workplace personal injury caused by heavy equipment, please contact us.